This past spring the president met with his White House counsel to discuss an idea. Donald Trump wanted to order the Justice Department to prosecute Hillary Clinton and James Comey, the FBI director he fired. “It is not clear which accusations Mr. Trump wanted prosecutors to pursue,” reported The New York Times. The counsel, Don McGahn, argued against it. He won the day. Trump shelved his boneheaded plan to Lock Them Up. Hillary remains free to collect six-figure speaking fees from ethically-challenged organizations and threaten to run for president again. That worked out OK. After all, it would be hard to overstate the political crisis that would result if a precedent were established in which the perils of running for political office were to include getting thrown into prison should you lose. But what about what was supposed to come next: the principled resignation? Don McGahn stared into the face of the Leader of the Free World and Keeper of the Launchcodes and saw—there’s really no more precise way to put it—a lunatic. “Mr. McGahn apparently was able to dissuade Mr. Trump from issuing the order to prosecute political enemies by telling him that the plan was so antithetical to American political values that it could trigger impeachment proceedings,” former U.S. attorney Harry Litman wrote in the Times. No one, not even Trump, needs anyone to tell them that the winner of a presidential election doesn’t prosecute the loser. Bush didn’t file charges against Gore, Reagan didn’t charge Mondale, and FDR didn’t go after Hoover. They do that kind of thing in Pakistan, not the U.S. If Trump didn’t know that already, he’s too stupid to serve and should be removed under the 25th Amendment. If he did know, he’s a tyrant in the making and should be impeached at once. Floating such a crazy idea is automatically, irrevocably, determinately disqualifying. No one should work for a nutty president (presidential nut?). Remaining associated with such a loon cannot make anything better. It cannot mitigate. It cannot save the republic. It can only lead to guilt by association. When you learn that the President of the United States is insane there is only one moral thing to do: call a press conference, resign and tell the world everything you know. Why? Does he need the money? Does he like the job? Does he believe he can successfully argue against Trump the next time he floats an un-American plan? Maybe he’ll soften some of the terms of martial law. I don’t know why he’s staying on. I do know there’s no good reason and no reasonable excuse. He should have quit last spring. Now that the news is public, so should everyone who works for Trump. There have been a lot of McGahns in recent years. No member of the Obama Administration resigned when he greenlit the illegal political assassination of Osama bin Laden, expanded Bush’s drone wars or bailed out Wall Street banks at the expense of Main Street businesses and homeowners. No one left the Bush White House when he ginned up a BS war against Iraq or authorized systemic torture in a new series of “dark site” concentration camps and covert dungeons. The last major resignation based on political principle seems quaint now. 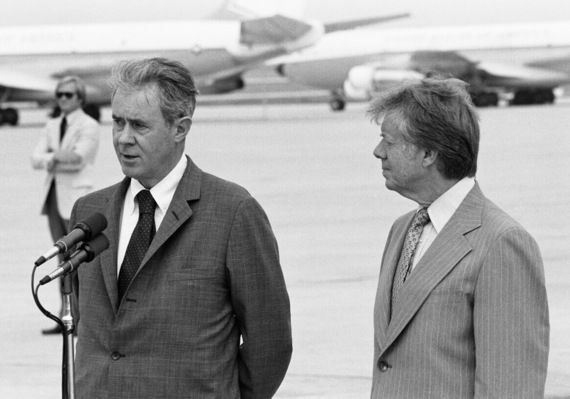 It occurred in 1980 when Cyrus Vance resigned as secretary of state because Jimmy Carter authorized a military operation, the failed helicopter rescue mission to Iran, rather than give diplomacy a chance to resolve the embassy hostage crisis. Alas poor Cyrus, we hardly knew ye! There never seems to be sufficient outrage (or accountability) to prompt someone to say no to a president or an opportunity. It’s not on par yet nevertheless worth noting: this week the White House Correspondents Association invited historian Ron Chernow to host its annual D.C. journalist-politico dinner. It’s the first time the soiree has been MCed by a non-comedian or humorist. The reason is obvious: the WHCA caved into Trump’s reaction to stand-up comic Michelle Wolf’s incendiary performance last year. Of course the president was angry. She was funny! Good humor is dangerous. Good political humor makes big political enemies and Wolf did. After the announcement that the WHCA had ditched satire in favor of historical reflection (why can’t we have both? ), Trump tweeted that he might attend this year. Chernow ought to be ashamed of himself. He’s allowing himself to be used. He’ll be remembered as yet another tombstone on the mass grave of American political satire and as the lickspittle of our rancid little president. But even the author of the “Hamilton” book used as the basis of the hit musical couldn’t resist the siren call of nationally televised attention. He should have said no. Given what went down last year between Trump and Wolf last year, any non-comedian ought to have said no. In 1969 Jean-Paul Sartre—Professor Chernow, I own your books and his and you are no Sartre—refused the Nobel Prize in Literature. “A writer who adopts political, social, or literary positions must act only with the means that are his own—that is, the written word. All the honors he may receive expose his readers to a pressure I do not consider desirable,” explained the father of existentialist philosophy. Sartre is better and more fondly remembered for his rejection than many of those who accepted it. This entry was posted in Blog, Columns and tagged Crazy, Cyrus Vance, Donald Trump, insane, jimmy carter, political ethics, resignation on November 21, 2018 by Ted Rall.